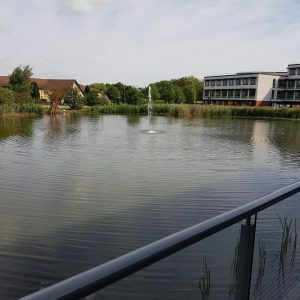 Preservation Treatments (Surrey) Ltd once again attended the PCA Conference at The Slate, University of Warwick, Coventry, this year. For the first time, we were presented with two days of speakers. Day one was focusing on ‘Residential Ventilation’ aspect of the industry, dealing with Condensation, Mould Growth, Environmental Monitoring and Fire Safety Risks. The range of speakers was fantastic, providing a whole new bank of knowledge to consume. 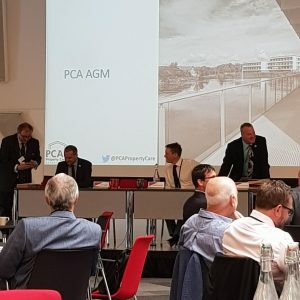 Day two started with the PCA AGM and GPT (Guarantee Protection Trust) AGM, where Preservation Treatments (Surrey) Ltd was represented by Paul Evans CSRT, CSSW. After the voting had been completed, we moved on to the more traditional section of the Conference, ‘Preservation in Buildings’. Again, with a superb array of knowledgeable and interesting speakers, covering subjects including proof from Dr Les Sellars that Rising Dampness does exist … and that the treatments we recommend are really effective! Talks included ‘Defects in Cavity Construction’, ‘Salts in Porous Materials’ to name but a few. We also heard from Dr Simon Curling about Biological Durability, and Hudson Lambert (Safeguard Europe) who told us about the proposed pesticides’ register, which long term will ensure that the chemicals we are using are the best possible to aid in the eradication of Wood Rotting Fungi and Wood Boring Insects. After the conference, we attended the PCA Awards Dinner, where PCA Best Practice Awards 2018 were presented. We were nominated for “Outstanding Customer Service”. 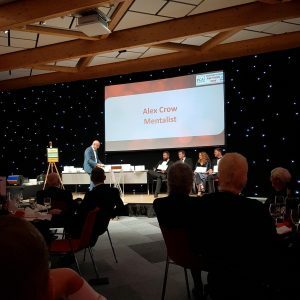 We had an interesting evening, with the evening entertainment being Alex Crow, who is a “Mentalist”. Alex was a wonderful choice, and had all of us mesmerised! Unfortunately, on this occasion we didn’t win the award we were nominated for, but that didn’t “dampen” the atmosphere. A great couple of days was had by all. We would like to thank Steve and Sue and all the team at the PCA for again providing us with a wonderful, informative event.